It’s here – another Holiday season, and while many are finishing up their shopping, others have yet to begin. Perhaps you’re less than inspired this year – that all this stuff we give to each other is just that, ‘stuff’. May we suggest something a little bit different. Something other than the mass produced, bar-coded do-dads that arrive on pallets from huge factories far away. Give a gift from the heart & hand. Here are some gift ideas. 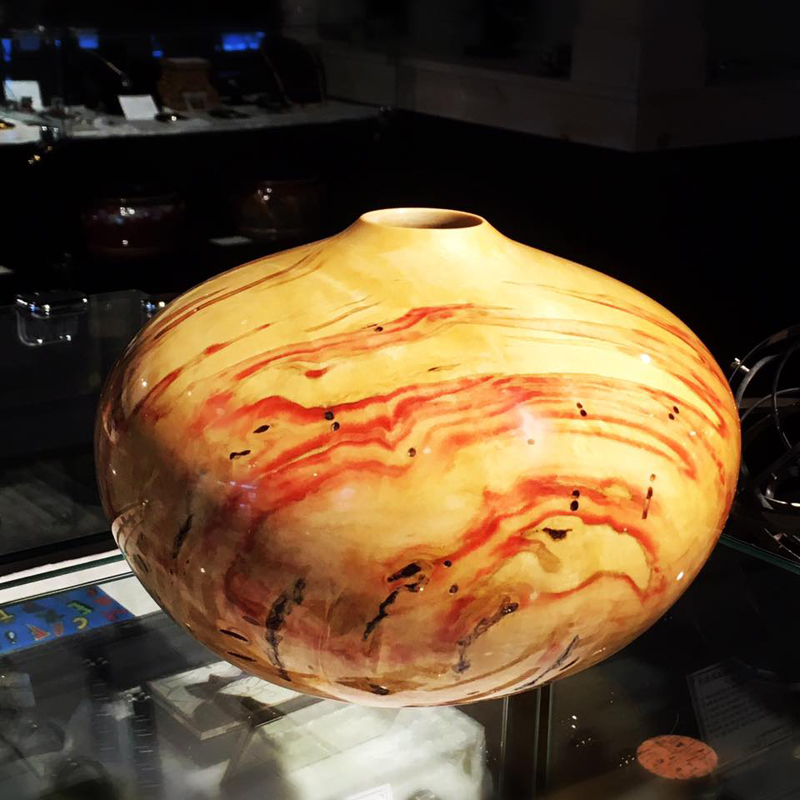 Art glass is one of our featured crafts we showcase in the gallery. 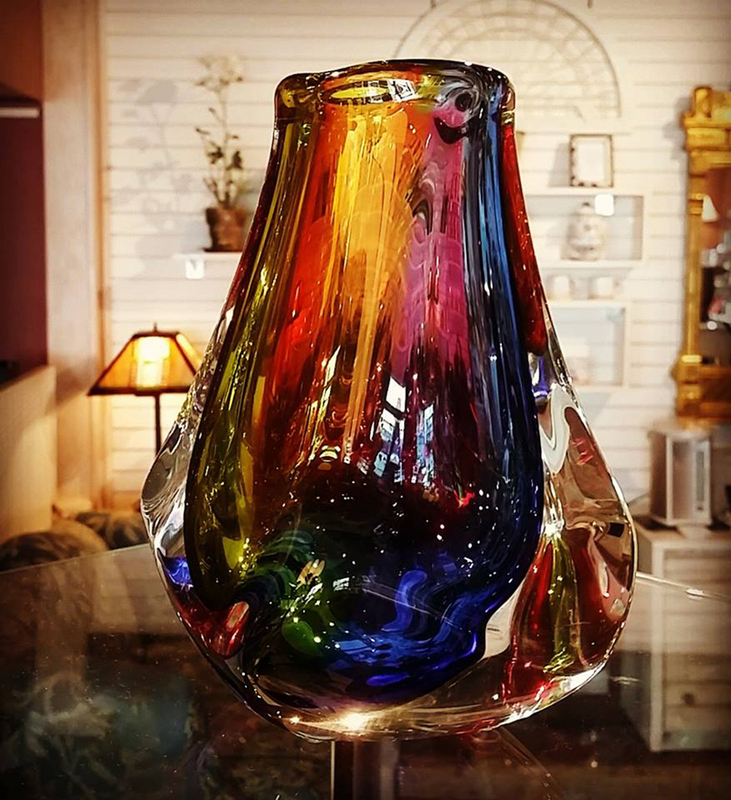 Like this beautiful vase from a California artist. 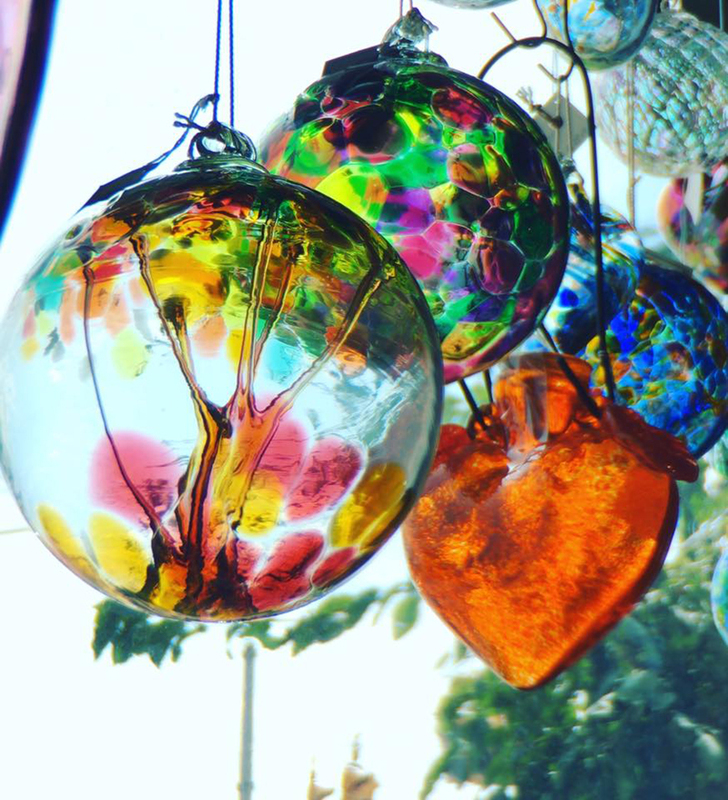 There is something magical about sunlight streaming through colored glass. These beautiful large hanging glass ornaments from a Canadian art glass shop can make that happen. 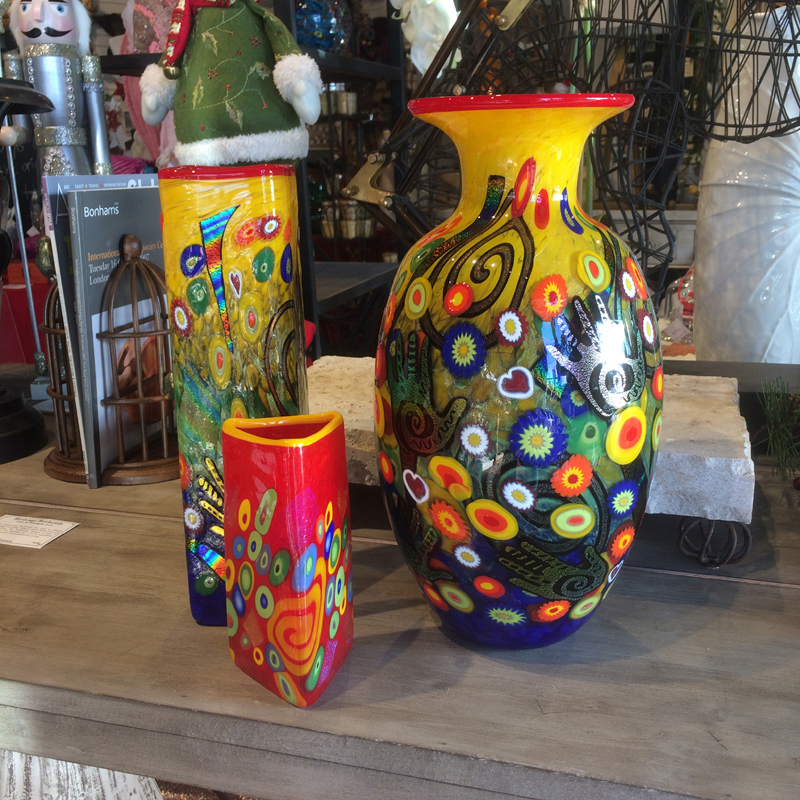 Or some of the most colorful glass vases you will ever see! 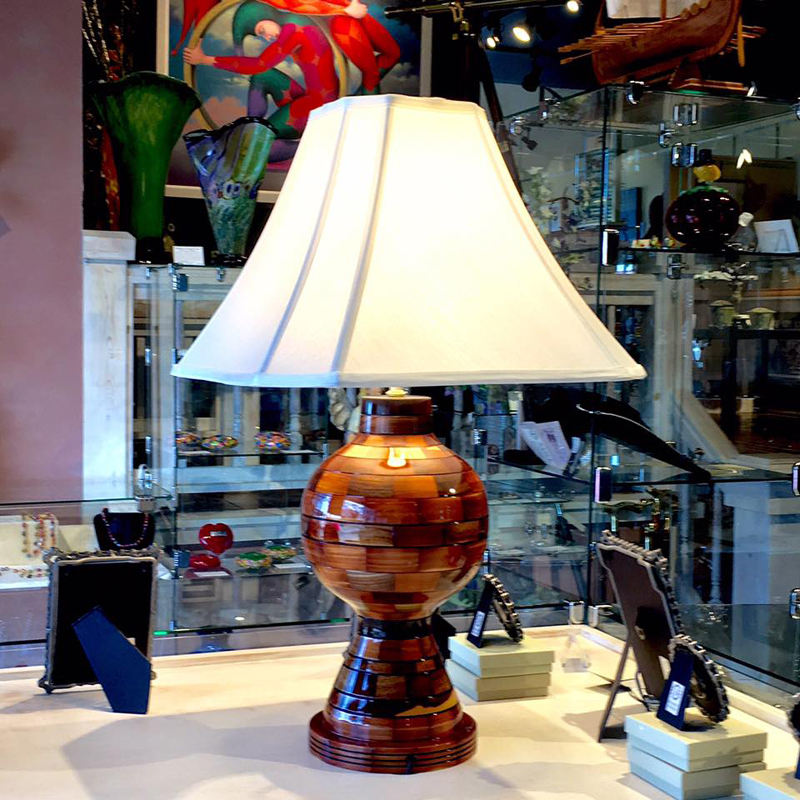 Hand made one at a time by a southern California husband & wife artisan team. Or how about one of the beautiful wood turnings by an Evansville physician? His work is some of the best in the nation, and they’re hand crafted right here in the city. This work is produced right across the river in Henderson Kentucky by a retired businessman. He creates beautiful mosaic wood works of art. Lamps, bowls and vases are meticulously crafted in his home workshop. 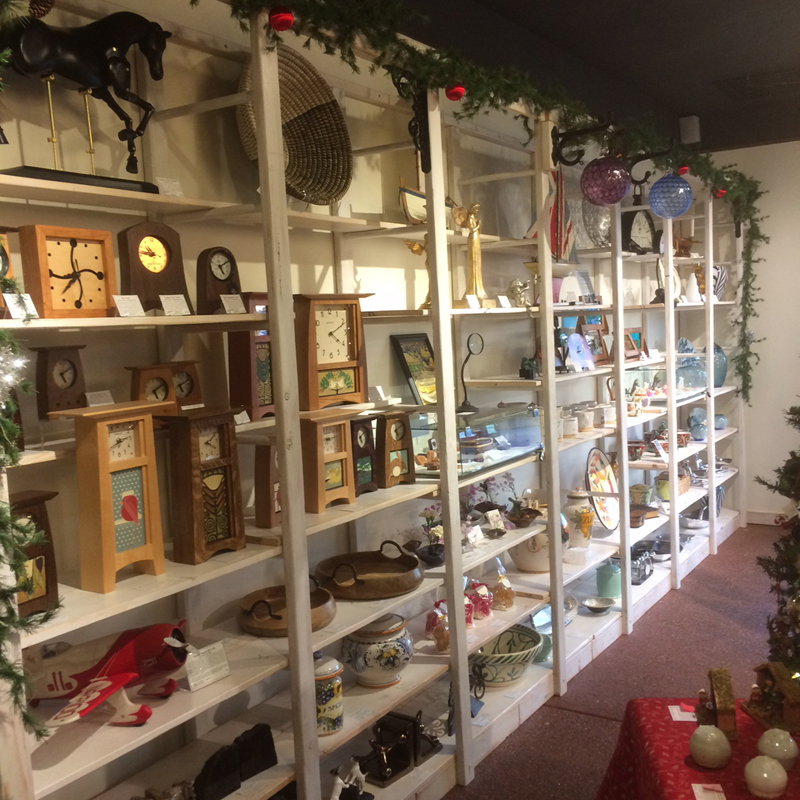 For something useful and beautiful, consider these hand crafted clocks. Many feature tile decorations created by the Motawi Tileworks. 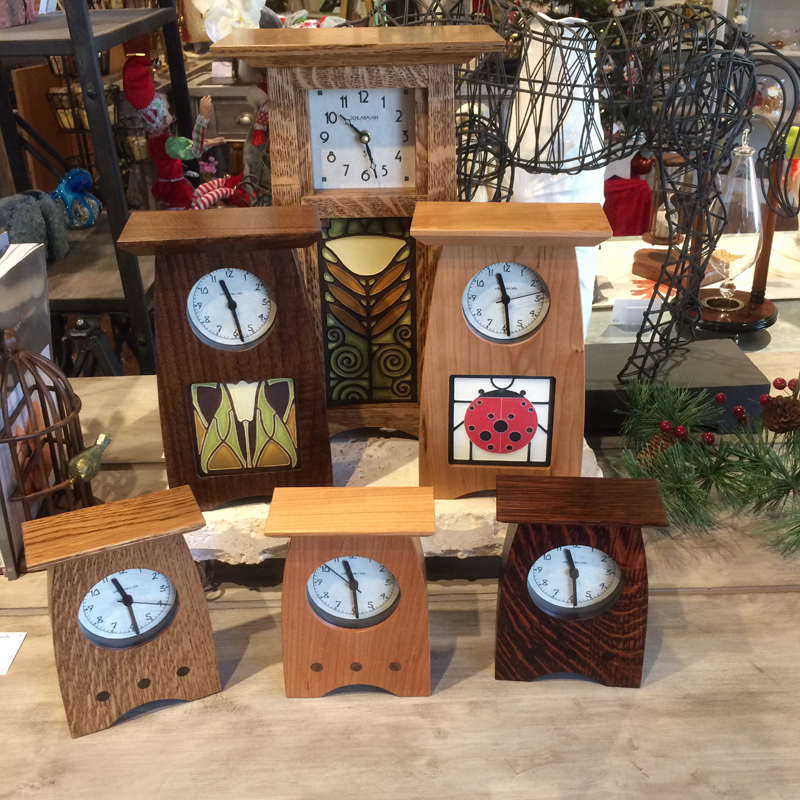 These solid wood clocks are hand made in a father & son workshop in Iowa. We highlight many Fair Trade items in the gallery as well. 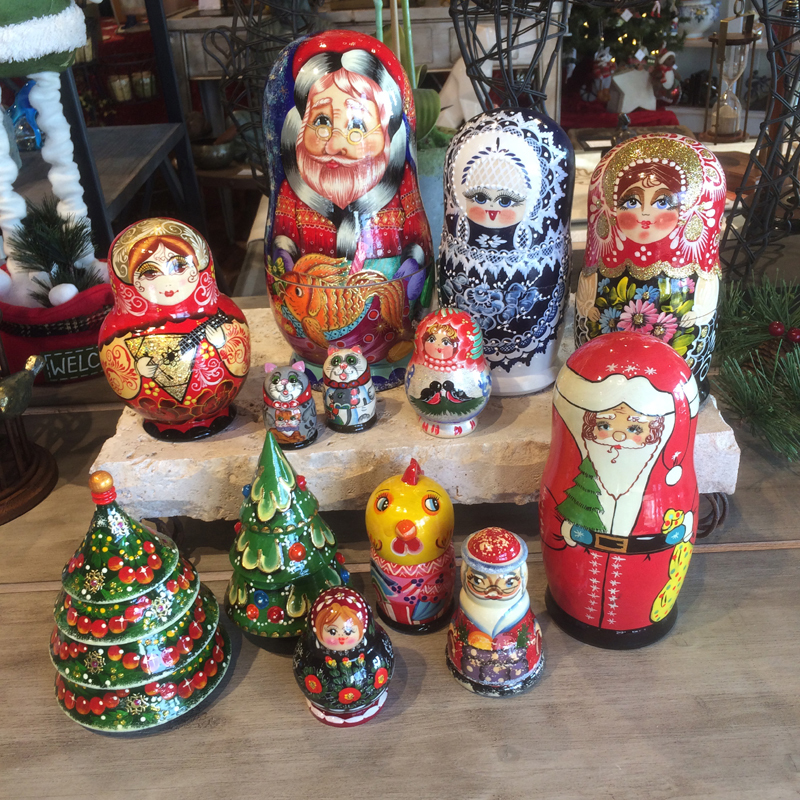 These Russian nesting dolls are crafted by small rural village families in the winter months when their farming operations are suspended. The traditional craft brings in income to support their small communities. Another Fair Trade workshop in India creates some of the finest sterling silver gem stone jewelry. Pieces like the Moonstone Pendant on the left and the Blue Topaz on the right are a couple from hundreds we have in stock. 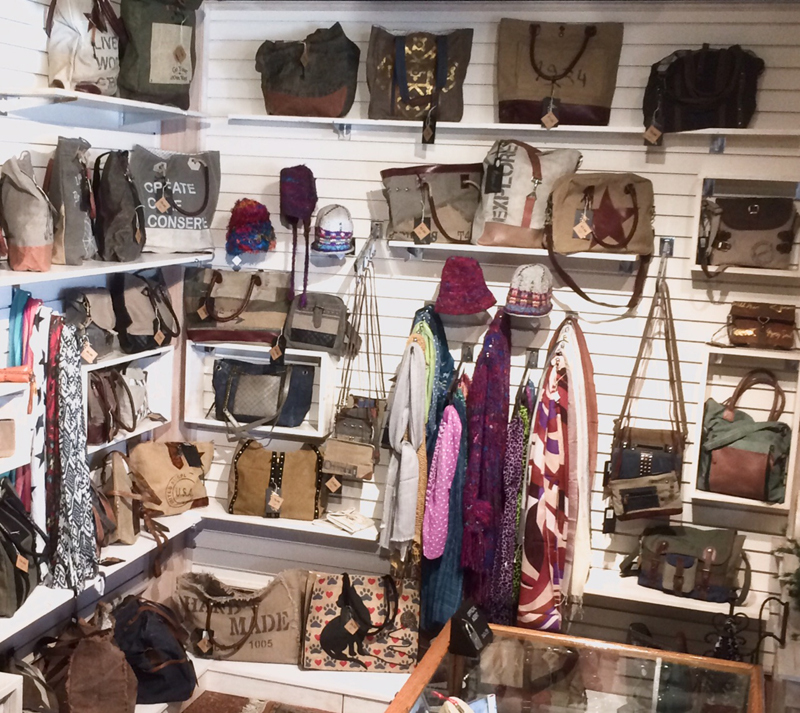 Other Fair Trade items are created by women’s cooperatives in India, Nepal and Tibet. Your purchase of these items create opportunities for women and children in developing countries. Pottery in all sizes and shapes are one of our featured collections. From the purely decorative to the utilitarian – we have a wide selection from potters from all over the country. 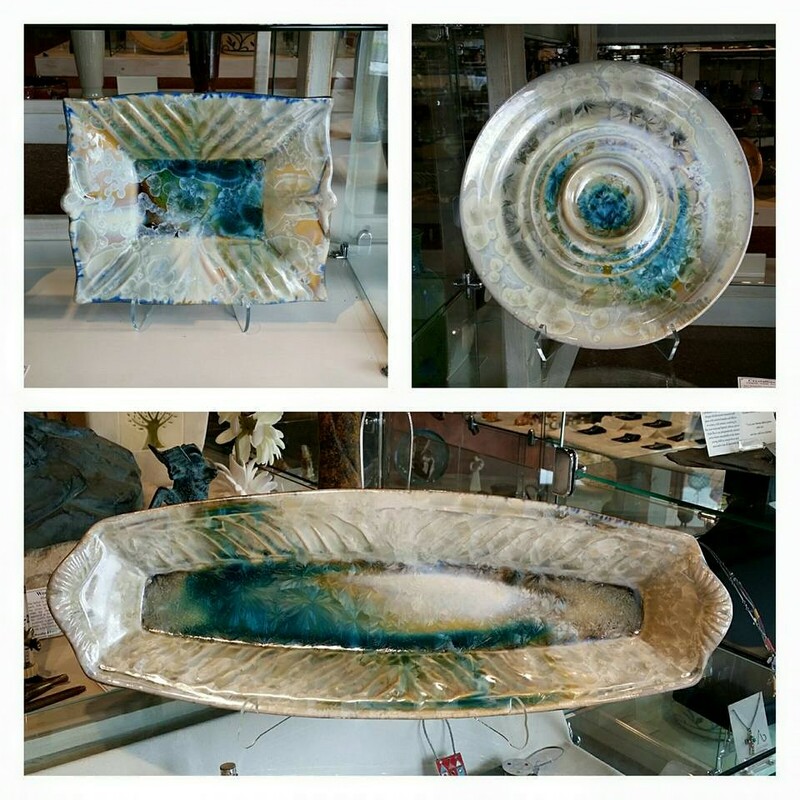 Above are crystalline glaze pieces from a Pennsylvania artisan workshop. 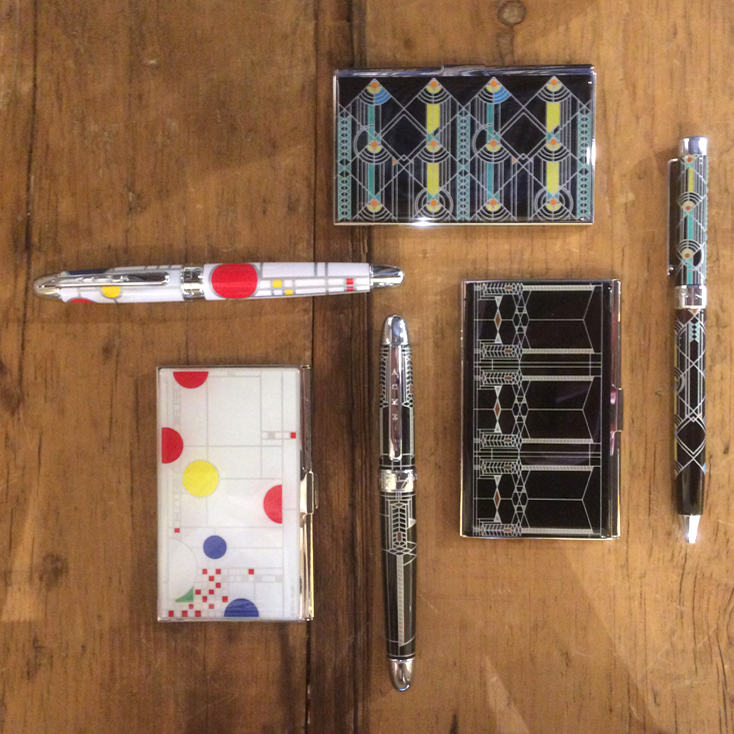 We have an eclectic mix of hand made items, like these licensed Frank Lloyd Wright pens and card cases from a design team located in Maui, Hawaii. 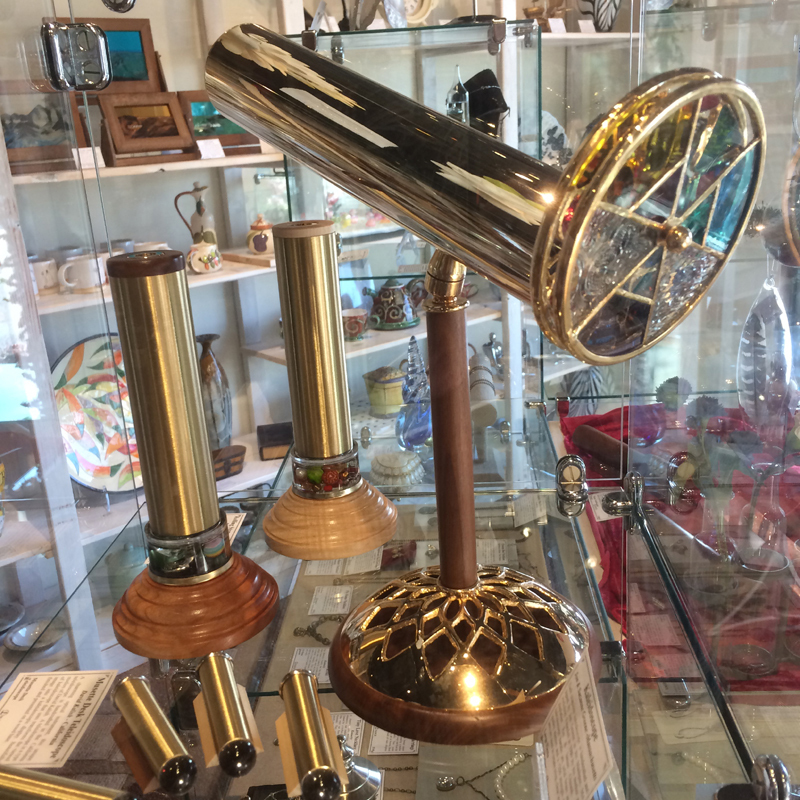 Kaleidoscopes? Yes, we have those too – from workshops in California and Massachusetts. Art work is also available – we have so much most are displayed on our web site that you can see ~ here~. 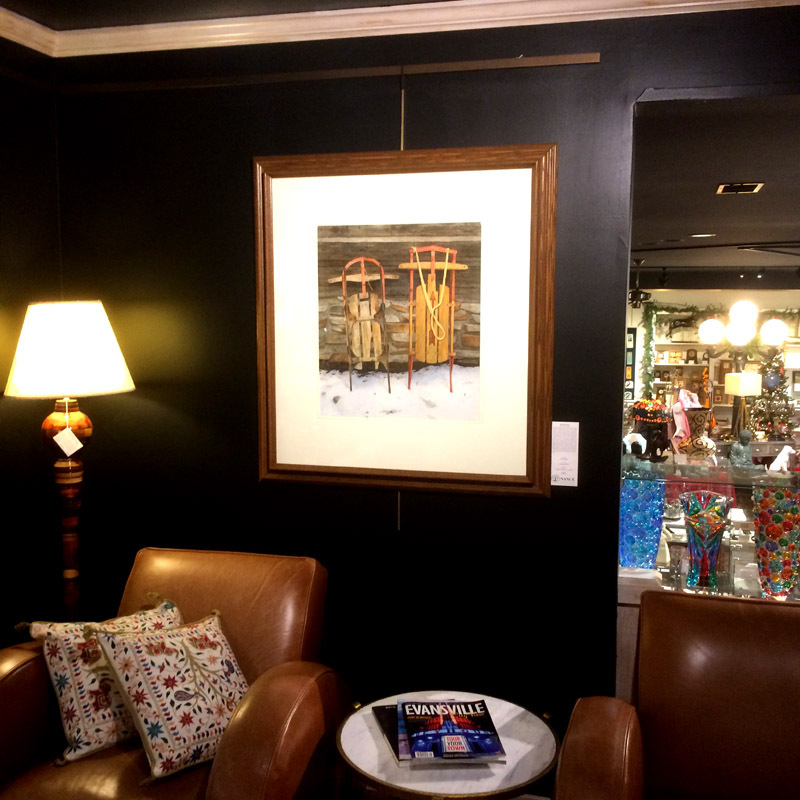 But this beautiful original watercolor by an Indiana artist hangs in the gallery. So if you’re feeling a little uninspired – perhaps this guide will help. The most important gift you can give this time of year is – you-. Your time, your thoughts, your love. If you do give a gift – make sure it’s one with meaning and thoughtfulness. If you made it this far, you deserve a ‘perk’. See below for savings! Just let us know at check out and save! We hope everyone has a very Merry Christmas and holiday season! We want to thank each of you for supporting our little corner of the world for 69 years. May the new year bring joy, happiness and health to you and your loved ones. < Previous Another Facebook Contest! Come on and Like Us!